Another one of the popular antivirus suites that are making their way from China into the U.S market is Baidu Antivirus 2015. The program has a load of features that are very similar to 360 Total Security and it has a light footprint on your system. Baidu has been trying to make a huge push into the antivirus market in order to compete with its direct competitor Qihoo 360. Therefore, the companies are going to have close to the same features but it is not as strong in protection. Not only that it also seems to lag behind in some of the new features that Qihoo has been cooking up for its international users. Malicious Plugin Cleaner is a tool that is similar to that of Avast Browser Cleanup and the clean up tool found in 360 Total Security. It will scan for the malicious plugins that might be infecting your browsers. System Repair another tool of the antivirus is very similar to cleanup as it works by removing potentially annoying files and improving the overall load time of your computer. Think of it as a one click checkup it will check for both malware and potential performance issues to keep your computer running in tip top shape. Traffic Monitor is something that does not serve a whole lot of use for the traditional user as it allows you to monitor what programs are using the internet and it allows you to check for abnormalities. Think of it as a simplified version of Window’s Task Manager. Ad Blocker is an interesting choice as it is something that is becoming more and more common but at the same time it is becoming a problem. Ad Blocker’s are good and they do serve their purposes, but they need to become a better solution to where it only blocks malicious and harmful advertising. This way only business’ using malicious advertisement networks such as Clicksor (in the past) would be harmed and required to clean up their act. While it is very effective it is concerning to see how we are evolving into a group who is stifling business. While Baidu does not boast as large as a database or as many antivirus engines as Qihoo’s 360 Total Security it does really well in protection tests. Scoring in the 80% – 90% range on the virus bulletin test it is among the highest scoring antivirus programs. However, the program has only been evaluated twice because of its small user base in the international markets. Baidu does have nice protection scores in zero-day testing labs but since it has limited engines and a smaller user base it is not as good as protecting you from a wide arrange of threats. Baidu currently uses 3 engines their cloud solution, their signature engine, and the Avira engine. Baidu antivirus does have some interesting features, it is noteworthy and it will keep your computer safe. While it is not the highest scoring antivirus program the clean user interface and the tools that it provides make it worth looking into especially if you are using an antivirus such as Microsoft Security Essentials (Windows Defender). 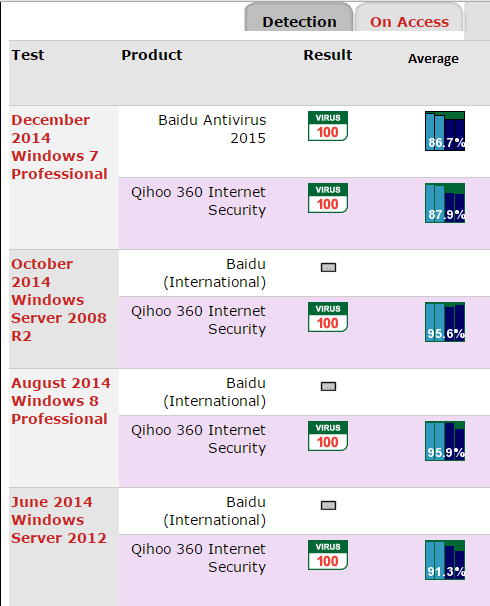 Baidu Antivirus 2015 is a great program that can help protect your computer from malware. Even though the program doesn't protect as well as 360 Total Security it still does very well in testing and its super easy to use.